Elastica have responded to rumours that they’ll be reuniting for new music and a tour in 2017. Back in January, photos were shared online of members of Elastica back together in the studio. However, it has now emerged that they were simply at Abbey Road to listen to a new cut of their debut album which is being reissued for Record Store Day. 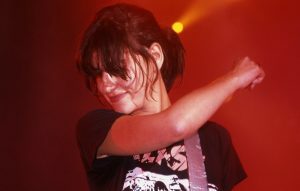 Frischmann also spoke out about her split with Blur frontman Damon Albarn – citing him finding it ‘hard’ to deal with Elastica’s success in America as one of the factors putting strain on their relationship. Elastica will be reissuing their debut album for Record Store Day on Saturday April 22 with a fanzine and flexi disc, which will feature the track “In The City” from their John Peel session. Frishmann will also be displaying a new series of her paintings at the Volta Art Fair in June. For more information, visit her website. Meanwhile, it has also been reported that Suede frontman Brett Anderson has written a book inspired by Frischmann dumping him for Damon Albarn. The pair dated while she was a member of Suede. The post Elastica respond to reunion rumours appeared first on NME.